Arvada City Hall is located at 8101 Ralston Road, Arvada, CO 80001; phone: 720-898-7000. Photo: Russell-Graves House, ca. 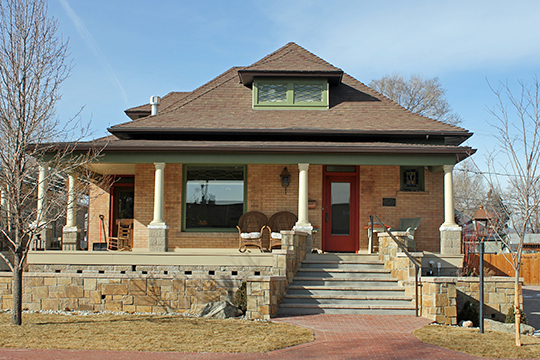 1899, 5605 Yukon Street, Arvada, CO. Listed on the National Register of Historic Places in 1983. Photographed by User:Jeffrey Beall (own work), 2014, [cc-by-3.0 (creativecommons.org/licenses/by/3.0)], via Wikimedia Commons, accessed November, 2015. Arvada, located eight miles northwest of Denver, in Jefferson County, was founded in 1870 as a service and supply center for the surrounding agricultural community, and grew into a city of more than ninety thousand residents. The man popularly referred to as "the father of Arvada," Benjamin Franklin Wadsworth, originally owned the land encompassing the Stocke/Walter Addition Historic District. Wadsworth was born in New York in 1827, where his father owned a resort known as Avon Springs. The family later moved to Ohio, where Wadsworth attended school and then farmed. In 1851, he married Mary A. Grove. In 1859, Wadsworth moved westward to Missouri and later Kansas to attempt farming. "Owing to famine and drought," he then traveled across the plains to Colorado in the same year. In the mining town of Empire, Wadsworth preempted land in 1861. He was described as "profusely active in buying and selling mining claims" in the vicinity for the next eight years. In 1862, Wadsworth bought a 160-acre farm at Ralston's Point (today's Arvada), where the family moved in 1869. The area contained a flourishing agricultural community which provided products for the mining camps and for Denver. Adjoining land on the west was being homesteaded by Louis A. Reno, whom Wadsworth joined in establishing the townsite of Arvada in 1870. R. Laurie Simmons and Thomas H. Simmons, historians, Front Range Research Associates, Inc., Stocke/Walter Addition, Jefferson County, Colorado, nomination document, 1999, National Park Service, National Register of Historic Places, Washington, D.C.